Alan Lindley has very kindly sent me, and permitted me to publish, this photograph. It was taken at Lowtown lock, on the Grand Canal, in 1911 or 1912. Alan says that the man on the left of the group — with cap, waistcoat and watch-chain, and with a dog standing in front of him — is the lock keeper, Murtagh Murphy, the great-grandfather of the present incumbent, James (Jimmy) Conroy. Murtagh was born in Ballycowan, near Tullamore, Co Offaly, in 1849 and, after working on a Grand Canal Company boat, married a Kildare girl and took the job at Lowtown. The boat had been described as a passenger flyboat but, as the Grand Canal Company had ceased carrying passengers in 1852, that seems unlikely. And the boat looks much more like a pleasure vessel than a working boat. If the Grand Canal Company had an inspection launch, this might be it, but I have found nothing to indicate that it did. The boat does, though, seem to have been designed for canal travel: it seems (from the twenty feet or so we can see) to have straight sides and to be well equipped with fenders. It might therefore have been designed to travel on the canals (as well as on other waters). At least one director of the Grand Canal Company, Henry Samuel (aka Harry Samuel) Sankey, of Fort Frederic, Virginia, Cavan and of 64 Wellington Road, Dublin, did have a launch or pleasure craft on the canal, the Aja, which you can read about here. Incidentally Mr Sankey, who died on 5 December 1925, directed “that no Roman Catholic shall take any benefit” under his will. 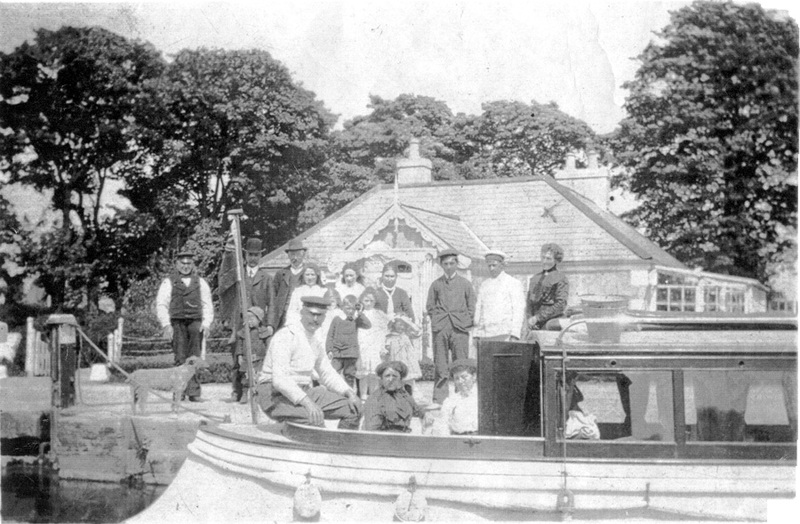 Further information about the boat and the people shown in the photograph, and about Mr Sankey’s launch, would be very welcome; please leave a Comment below. This entry was posted in Ashore, Built heritage, Canals, Extant waterways, Historical matters, Industrial heritage, Ireland, Irish inland waterways vessels, Operations, People, Politics, Sources, Steamers, Water sports activities, waterways, Waterways management and tagged Ballycowan, Conroy, director, Grand Canal, launch, lock, Lowtown, Murtagh Murphy, Sankey, steamer. Bookmark the permalink.